BDS 2.5" lift kits are available for 1953-68 Jeep® M38A1. Each kit includes front and rear Glide-Ride leaf springs which feature tapered leafs, anti-friction pads, bolt style leaf alignment clamps and a full military wrap to protect your spring eyes from the rocks. If you are actually capable of breaking the main leaf, the military wrap will allow you to limp home off the trail. 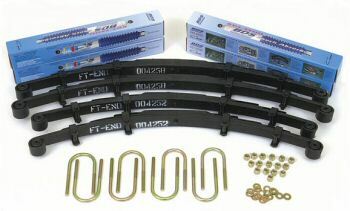 These springs are made to perform offroad as well as get you to and from work. These spring come with OE style rubber bushings. New u-bolts are included in the box kit.